Jón Nordal (b. 1926) celebrated his 90th birthday in March 2016. 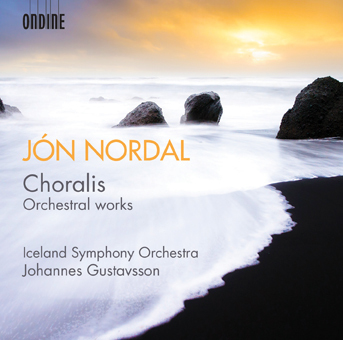 Nordal is an important representative of contemporary Nordic music but the Icelandic composer has remained as a relatively unknown figure outside of his native country. The Iceland Symphony Orchestra under one of Sweden’s leading young conductors Johannes Gustavsson offer a unique glimpse into the creative world of this neglected composer with this release that contain five of his major orchestral works. Nordal studied in Europe extensively after the war in the late 1940s and 1950s, and since 1957 participated also in summer courses in Darmstadt. This had a major impact in Nordal’s creative work. There he came personally in contact with the leading European composers and in touch with the latest trends in contemporary music. In time he created a distinguishable personal style based on a perfect compositional technique. This recording includes a set of three orchestral pieces written in 1973–75 (Leiðsla; Epitafion; Langnætti) in the height of his creative powers, as well as an earlier orchestral work from 1966 (Adagio) and one of his masterpieces, Choralis, from 1982.